ARCADIA, Michigan — The warm, setting sun slowly sank into the horizon, out past those limitless waves of blue, gently lapping the sandy shores of Lake Michigan below us, reflecting up onto the sky above with the most postcard-perfect purple haze you’ve ever seen. We’re sitting on a white wooden park bench parked on the side of the 12th tee box of the (newly renamed) Bluffs course at Arcadia Bluffs Golf Club, patiently waiting our turn, and contemplating just how wonderful life can be. Of course, this lake, this view, this experience is the supernatural, intangible ingredient that has made Arcadia Bluffs what it has been for the past two decades, which is one of the very best golf clubs on the planet. But here in the tiny northern Michigan town of Arcadia, just south of Sleeping Bear Dunes National Lakeshore, the place named America’s Most Beautiful, we have proof the best can get even better. New lodging. More lodging. A fitness center. New dining. A full-fledged lodge. These were all part of the incremental changes the club has made in the past 10 years, slowly, thoughtfully, consistently. 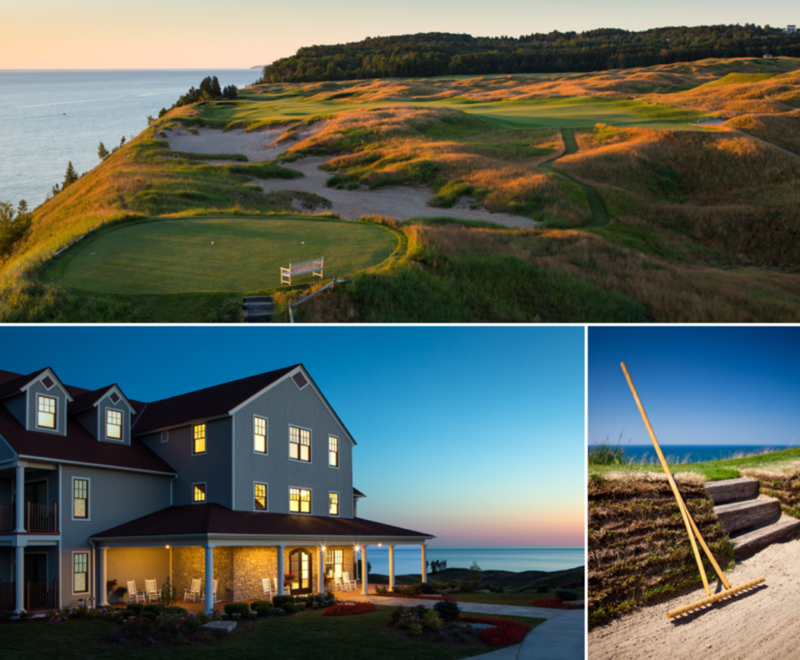 But this summer, Arcadia Bluffs unveils its biggest change yet, adding the sensational new South Course on Aug. 1, instantly transforming itself from a golf club, to a golf destination. More than it even was already. While it might seem post-modern, the South Course’s architecture is as old-school as it gets in America, an homage to Chicago Golf Club. Photos by Nile Young, Jr. 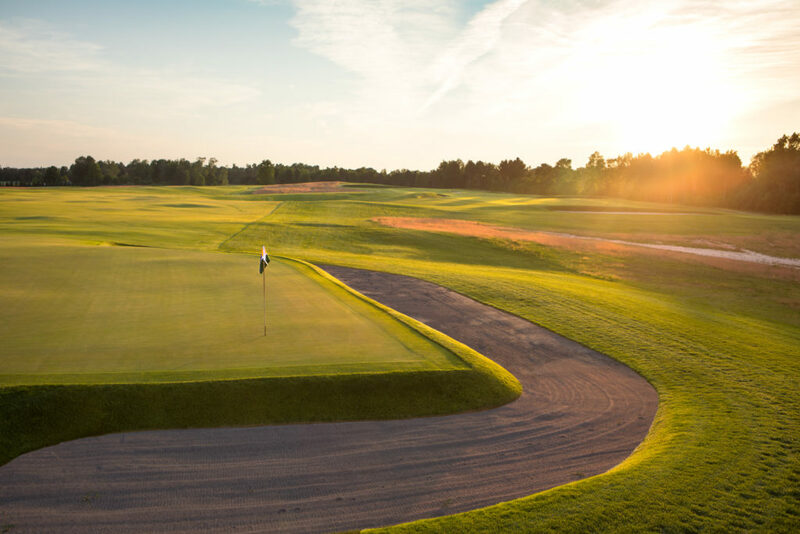 The South Course — all 7,412 yards of it — is turning the spotlight back to this corner of the Midwest, thanks in large part to its big brother, yes, but also its designer, the ascendant architect Dana Fry, of Fry/Straka Global Golf Design. Fry is most famous for his co-design on the other side of the lake, Wisconsin’s Erin Hills, host of the 2017 U.S. Open, but he’s had a long, successful career working with Tom Fazio and especially Dr. Michael Hurdzan. Despite his past success, the South Course is undoubtedly Fry’s biggest, boldest solo design yet. And as he puts it, it had to be. What it does have, however, is an architect and an owner completely aligned in a singular vision. 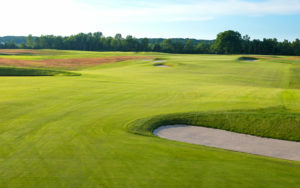 Arcadia owner Richard Postma and Fry wanted to build something dramatically different than the Bluffs, different than almost everything else in the Midwest, save for a quirky, classic, little course called Chicago Golf Club. “The summer before last, summer of ’16, I get a call from Warren (Henderson, one of the architects of Arcadia Bluffs and a longtime friend) and he says, ‘Well, we’re going to be working together real soon.’ I said, ‘What do you mean?’ and he says, ‘Rich (Postma) has decided he’s going to build another course and you’re doing it.’ And that was it. 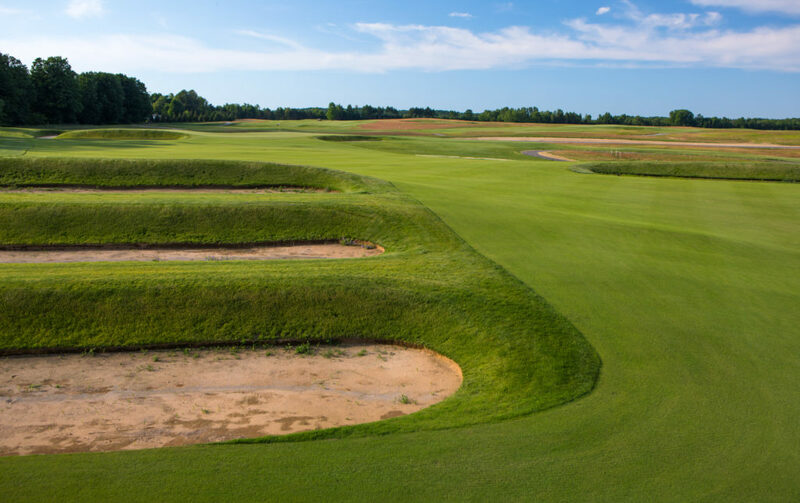 The “stair-step” bunkers on the 417-yard, par-4 17th are destined for fame — along with the rest of the South Course. The result is a geometric, asymmetric homage to the greats of golf course architecture, C.B. Macdonald, Seth Raynor and Alister Mackenzie. With 90-degree angles — right edges! — on the greens, flat-bottom bunkering lying perpendicular or diagonal to the fairways, even square greens, the South Course isn’t just different than the Bluffs, it’ll be an experience unlike most have ever played. And that’s the … ahem, point. “Those two courses could not be more opposite,” Fry said. “I mean, the bunkering doesn’t look like each other … there’s not one mound on this property, I can assure you, there is none. The high points are the greens. That certainly isn’t to say the South Course isn’t visually appealing, or memorable. Indeed, even six weeks before opening, it’s clear it’s shaping up to be a beautiful bookend to the Bluffs. “I’m doing things that I’ve never done, like, I’m taking fairways that are doing dead-straight lines for 200-300 yards, in the fairway,” Fry laughed. “And the way the bunkers are cut in diagonally into the fairways. Fry and the universally acclaimed Arcadia Bluffs groundskeeping team even took a trip to the Windy City to see the ways of the Chicago Golf Club crew, how that team tackles the quirks inherent to such a demanding design. No, crazy might just be the course itself. The first hole is preview of everything that’s to come, with some of all of the South’ design elements for good measure. At 429 yards from the tips, this par 4 offers a sod farm-sized fairway to aim at off the tee (average size, 55-60 yards wide), bunkers cutting in at right angles across the fairway, and a false front to the enormous, angular green. The South Course will be known for the sheer size (they average a whopping 9,600 square feet — about a quarter-acre) and squared shape of its greens, which are at times comically huge and contoured, and exaggerated in their angular appearance. For Exhibit A, you need only turn to the heavily tiered green at the 604-yard, par-5 third hole. Quite nearly a perfect square, the third is one of several such greens on the course, often flanked by wraparound, flat-bottom bunkers like corner tabs in an old-time picture frame. Other highlights on the front are the 200-yard, par-3 fifth, which most days plays into the prevailing, howling wind whipping off the lake, and the 461-yard, par-4 ninth, with its own cubist creation for a green. The back nine is where things really get interesting, however, starting with the stunning, 189-yard, par-3 12th hole. The terrific 12th has the most memorable green on the course, an upside-down horseshoe wrapping around a devilish pot bunker, sloping off sharply on all sides. Hit it on the wrong side of this horseshoe, and your luck will most definitely run out. The 447-yard, par-4 13th was the last to be built, and the most “familiar” aesthetically, playing to a bit of a bowled, rounded Biarritz-inspired green, a large swale in the center to contend with. It might be traditional, but it’s a beauty. Traditional goes back out the window very soon, and outright heads for home at the sensational, 417-yard, par-4 17th hole, which plays uphill and over the “stair-step” bunkers on the left side of the fairway. These are reminiscent of the “church pew” bunkers at Oakmont, but these flat-bottom beauties stack atop each other, climbing the hill toward the squared-off hole. The 429-yard first hole offers a bit of everything you’ll see on the South, including its ubiquitous flat-bottom bunkers. While some of the South Course’s asymmetrical aesthetic is obvious from ground level, much of it is only noticeable from the air, and the drone footage better shows Fry’s brilliance here. The rest is a surprisingly subtle history lesson of the oldest design trends in America. What will the average American’s reaction be? Fry can’t wait to find out. 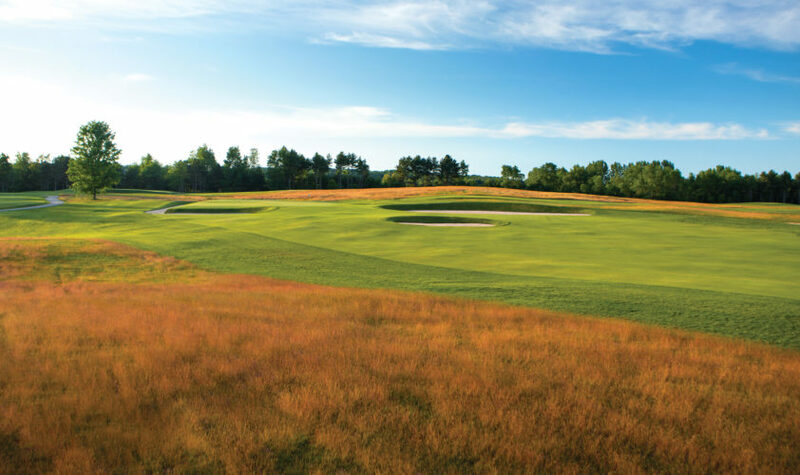 “A lot of players at Arcadia are also members at some of the high-end clubs, but the vast majority have never heard of Piping Rock, The Creek Club or Fishers Island,” he said. “They literally have no clue what these places are. It’ll be very interesting to see their reactions, when they go to the first green, and the right side is 140 feet deep, and the right line is dead straight, and the front is dead straight, with this massive false front on it. “They’re going to think this is wild. It’ll be interesting to see how they like, what to them is new, but what is really old school architecture — to the extreme. The South Course is definitely all that and more. Is it a risk to do something so polar opposite what has made the club so successful? Maybe. But it’s hard to bet against an owner and a team that seems to somehow get it right in everything it’s ever done. But unlike its billion-dollar view, Shriver says the secret to their success isn’t magical: It’s simply listening to their customers. “Most of the changes we’ve made over the years — almost all of the changes we’ve made — are bred from the need, guests ask for it,” Shriver said. “At first you hear, ‘You know, if you had this, it’d be good, or if you had that.’ And after you hear it 10 times, you think, ‘That’s not a bad idea.’ Everything we’ve done over the years is borne out of people asking, and that turns into more — more of everything. Yes, sir, you most certainly do. Green fees on the Bluffs are $195 peak, $90 after Oct. 10, while the South Course green fees are $150 peak, $75 after Oct. 8. Visit www.arcadiabluffs.com. Once a lonely outpost, Arcadia has added quite an array of lodging options over the years, including The Lodge, with 15 guest rooms and one suite above the main clubhouse, most facing west with a jaw- dropping view of the lake and the Bluffs Course. The Cottages offer 1,900-square-foot, four-bed, four-bath gated cottages on the hillside behind the Bluffs’ second hole, complete with all the comforts (maybe more) of home. And the new Bluffs Lodge, which opened last year, features 21 guest rooms with two queen beds, as well as a stellar fitness facility. Arcadia is also home to diverse dining options, including the main Dining Room for more formal affairs full of locally sourced fare (filet mignon and morel mushrooms? Yes, please), while the stellar Lakeview Room is perfect for a more casual drink or dinner, and the Sunroom is Arcadia’s answer to elegant events. Arcadia’s view is beyond beautiful, but the experience is about the little things, too: The park bench on the tee of the 12th green on the Bluffs is a sea of tranquility. The stairs in the cavernous bunkers. The snowy owl that’s made the club its home (really). The Adirondack chairs lining the patio above the 18th green, an unbeatable sunset spot. The way dogs aren’t just welcomed, they come to work with their owners. The way your heart jumps when you come through the front gate — every time. And yes, the sunsets. Heavens, yes.